Boy Scout Troop 218 in Exeter recently purchased a troop flag with funds from recycled cans donated by John E’s. Standing with the troop is John E’’s owner, John Graham. 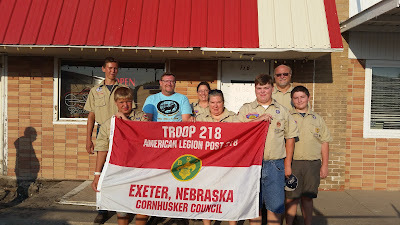 Pictured back row from the left are Clint Oldehoeft, John Graham, Assistant Scoutmaster Laura Sysel, Scoutmaster Dean Bartu and Tyler Sysel. Front row from the left are Mikey Bartu, Assistant Scoutmaster Leesa Bartu, and William Yokel. Troop members not pictured are Braden Capek and Ben Bartu.